Christmas season recommendations continue this week with an all-time holiday classic: Scrooge. Like the not dissimilar It’s a Wonderful Life, it came by its standing as a beloved film democratically: Long after it was released generations of people fell in love with it on television. And with very good reason. The heart of this film is Alastair Sim, whose lack of a 1951 best actor oscar nomination should make the academy hang its head in perdurable shame. More than any other movie adaptation of Dickens’ novella, screenwriter Noel Langley’s treatment gives Scrooge a backstory that explains his nature and outlook, making him a more fully developed character. Sim must therefore portray powerful moments of grief, cruelty, pity, parsimony, regret, remorse and manic joy, and he does so in a profoundly effective way. He was so damn good in everything he did (e.g., Green for Danger, recommended here some time ago) that it’s hard to say which is his greatest film performance, but this may well be it. 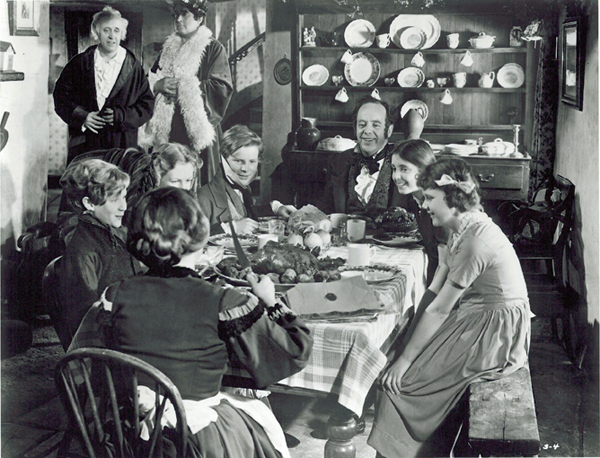 The cast is packed with highly professional British character actors including Peter Bull as the narrator and as one of Scrooge’s business colleagues, the ever-endearing Hermione Baddely as Mrs. Cratchit, Michael Hordern as the mournful Jacob Marley, George Cole as a young Scrooge and Carol Marsh (just as saintly as in Brighton Rock, recommended here) as Scrooge’s beloved sister, and many, many more. They were all part of the army of stage-trained actors who helped make the British film industry the powerhouse it was after the war. The sets and the photography are all spot-on. The editing is by Clive Donner, by the way, who went on to make his own fine version of Dickens’ story with George C. Scott. The other person who deserves credit of course is Charles Dickens himself. It’s sentimental to be sure: The Cratchit family is so idyllic that the Brady Bunch looks like the Manson Family in comparison. But the social conscience of the story, the condemnation of materialism and selfishness, and the emotional power of redemption are just as effective today as they were in Victorian England. When I look at the rising level of inequality in the U.S. today, I think we badly need another author of Dickens’ talent, humanity and mass appeal. p.s. For a visually stunning animated version of the same story featuring Sim and Hordren, see my recommendation here. p.p.s. USA title “A Christmas Carol”. BEWARE THE COLOURIZED VERSION! p.p.p.s. Interested in a different sort of film? Check out this list of prior film recommendations. One of the more unusual treatments of Dickens’s story is “Blackadder’s Christmas Carol”, with Rowan Atkinson as Ebenezer Blackadder, a kind, saintly man turned into a cruel, miserly misanthrope after visits from various neighbors and ghosts. It’s very funny. It’s available from Netflix, and was also packaged with bonus material in one of the DVD sets of the four seasons of “Blackadder” — I don’t remember which one. 100% agree- this ’51 version w/ Mr. Sim is my favorite version of all movie adaptations. I still try to use “It’ll be a fine pudding Martha” at least once in my in-laws’ kitchen every year at this time. God bless us, everyone. I grew up watching this every year and will watch it any chance I get. How did they make such a perfect film without CG? And colorization? Sacrilege!